Caught the last hour Monday night with my wife on board. She always brings me luck when aboard and this time was no exception. Set anchor on the broad creek side of point. After about 15 minutes of pluggin, I had a nice swirl. 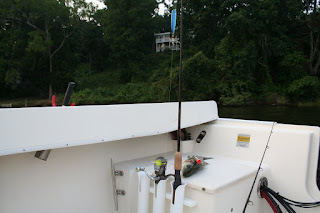 My wife was on front of boat playing with her camera and I told her to focus on that spot and I would hit it again. Right on que she smacked my Chug Bug again. Nice fat TCTC 18. Weds my youngest daughter joined me in the same spot, but luck was gone. Tonight I headed out to the River side of point and picked up another on trusty Chugbug.